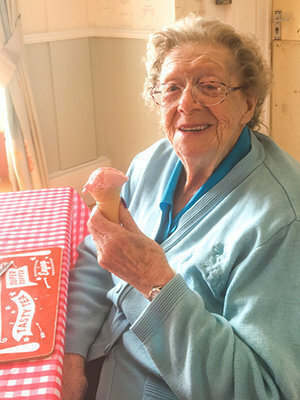 Our residents at Rowena House residential care home in Conisbrough, South Yorkshire, recently enjoyed some classic seaside treats; fish and chips in paper, ice cream and doughnuts. The seaside-themed day, aimed to take residents back to sunny days enjoyed beside the sea was embraced and enjoyed by all. Residents were also able to stretch their arms and legs by exercising with inflatable beach balls, used as part of the themed day. The activities programme at Rowena House, situated between Doncaster and Rotherham, engages residents in their favourite pastimes and hobbies and ensures that they remain stimulated and engaged.